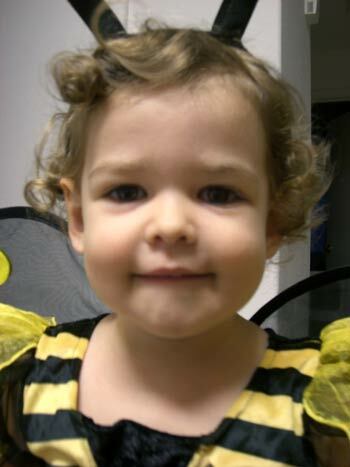 Our little bee went to the mall to trick-or-treat tonight. We decided that Amanda’s best bang-for-the-proverbial-buck would be there rather than on our most likely nearly deserted streets and we were right – it was packed! Can you blame everyone? Nearly all the stores participated, making it a very easy score for a lot of candy, not to mention a great way to make sure your kids are doing something safe. What is it about kids and trains? Now that’s what I’m talking about – candy! This is what everyone, not just kids, wants. Bow Wow Wow said it – “I Want Candy!” – and the majority of the mall listened. There is no other name for this level – this is the heart of Halloween: sugar, and lots of it. Well, it’s a good way into the day and so far I’ve only seen a couple representations of the Halloween staples for women: cats and pajamas. And, to be completely honest, I haven’t technically seen cats but the alternate animal, bunnies. Same thing, different ears and tail. By 9 am I had eaten more candy than I think I have in an entire year, and I think I’m good until about Oct. 31, 2008, by the way I feel at the moment. Idiot defined: whoever it is that invented the keyboard and didn’t immediately think to cover it in a sheath of plastic/rubber/silicone/whatever. I mean, come on, these things are just built to store dust and other disgusting things. Do you know what I did today? I lost a piece of turkey in my keyboard. A piece of turkey. Right between the Windows key and “arrow pointing at something that should elicit fond memories of menus” key. I tried using the tip of a pen to gently nudge it back out. What did I do? I split it in two and shoved it further down. It wound up completely under the keys. I had to pry the Windows key out just to get it out – there’s no way I was leaving turkey, even this little sliver, in my keyboard. And let me tell you, it was scary under there. That turkey would not have been alone. There’s a whole ecology that has sprung to life under my keys. Amanda has become addicted to yet another one of Disney’s creations: Little Einsteins. I guess it’s not horrible – it could be some completely saccharine, meaningless tripe, but I really question the value of teaching children about art when the art in question is usually barely even mentioned – it’s usually used as a backdrop for their exploits. The music is a little better – being “classical” music, it’s at least something intelligent, not the typically inane crap that fills a lot of kids’ shows, although I do have a problem with them having to overlay stupid lyrics on top of the pieces, but whatever – it makes it more memorable to the kids. At least the Einstein people have stopped trying to claim their products (and this music) make your kids smarter. I’ve also found it annoying that in one episode, during which three flying pigs get stuck flying, get this, adagio, moderato, and allegro. Okay – keep in mind that they’re introducing young children, ages 2-5 or so, to concepts like that, but something as commonplace as the thing that measures your speed is a little too complex, you know, the “speedy-meter,” as they call it, might go over their heads because when are those youngin’s ever going to hear the term “speedometer”? Man. My favorite thing involving this show lately, however, has been this Halloween episode they’ve been playing. They’ve got a racially diverse cast, see, and that’s nice. There’s a little blonde girl, an asian girl, a caucasian boy, and an African-American boy. It’s balanced, and they seem to make an effort to have the kids be specialized in areas that are not cliched – June, the Asian girl, is a good dancer, and Quincy, the African-American boy, is good at music. Cool. 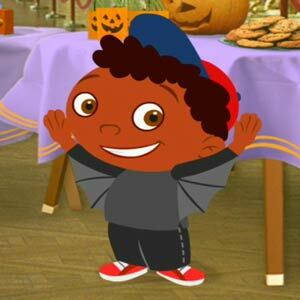 Except in this episode, they make one colossal mistake – little African American Quincy (we could take issue with his name, possibly, if we really want to get nitpicky about stereotypes) shows off his Halloween costume . . . and it’s a bat. You might not be aware, but the term “bat” is an old, very racist term. I’m really very surprised Disney would let this slide through – surely someone would have caught this. Using more eco-friendly materials is a really wonderful, earth-conscious effort. Who can’t get behind that? I do have to admit that I miss my styrofoam cups – they kept drinks from sweating all over the desk and kept drinks both hot and cold, whichever they were supposed to be, and without need for a condom. I know it’ll make a huge difference when I toss every cup into the recycling can trash can . . . oh, that’s right, we forgot one vital step in that “going green” equation: the recycling part. After a couple of albums that saw the band straying toward slightly more “mature” material, La Cucaracha finds Ween firmly back in Chocolate and Cheese territory – at least in spirit, if not necessarily in sound and style. If you had missed the days of Ween being wildly eclectic, jumping from genre to genre, then La Cucaracha is likely going to please you. New listeners, however, might still be left scratching their heads a bit. That is, of course, assuming that new listeners even take chances like this anymore. The first reaction to a Ween album for the seasoned fan isn’t typically what it is for the uninitiated – who might be counted on to utter phrases like “Did they just say that?” and “This is so wrong.” No, long time fans know what to expect when it comes to the lyrical part of the equation – being offensive is simply part of the fun for the Dean and Gene Ween, and no one is exempted, which makes it fair in a perverse sort of way. What fans look for is just what the band took on as inspiration, because if one other thing is true about Ween, it’s that they’re masters at mimicking their idols – even if you can’t quite figure out who it is. That’s not to say that everything they do is imitation, it’s just that they do it so well. On La Cucaracha, closing track “Your Party,” (which features the saxophone of David Sanborn – a fan of the band, believe it or not,) elicits the vibe of smooth early 80s pop, the kind of stuff that was soaked in coke that Bryan Ferry was so good at doing, while “Sweetheart in the Summer” sounds a bit like Nick Lowe’s brand of rootsy country-rock. And often it’s just taking on a genre in particular – sludgy reggae in “The Fruit Man,” good ol’ country, a genre they spent an entire album exploring (1996’s 12 Golden Country Greats,) with “Learnin’ to Love,” and most surprising and entertainingly on this album, the electro-disco of “Friends,” with its ambiguously gay “let’s be more than just friends” message that is, frankly, almost entirely due to the music itself. (Not that there’s anything wrong with that, you know.) “Blue Balloon,” bouncy and dreamy at the same time, bears those odd, helium-influenced vocals that marked early Ween tunes, and calls for repeated listens. It doesn’t sound like anyone or anything other than Ween – and that’s just fine. If there’s a complaint to be issued, it’s almost solely aimed at “Woman and Man,” a meandering 11 minute Santana-esque jam that simply goes nowhere once the 3 minute mark is breached. That might be the point, that jam-band music goes nowhere. I’m not sure – all I know is that I simply don’t want to sit through this too many times. It’s just too punishingly boring to sit through to discover the hidden nugget of truth that, I hope, is buried somewhere in the song’s meaning. As usual, there are a couple of real surprises in store. Quebec had the beautiful “Chocolate Town” and the Pink Floydian “Transdermal Celebration”; White Pepper boasted the odd mid-tempo ballad “Stay Forever” and the gentle “She’s Your Baby.” La Cucaracha is no different, except that the attitude has changed – it’s not slower, gentler songs alone being used to showcase the band’s strengths. The first surprise opens the album: “Fiesta,” with its bright, blasting mariachi horns, is the kind of high energy, boozy party theme that could land the band more attention than ever before – it sounds like nothing Ween has ever done before. In fact, Dean Ween told the UK magazine Bizarre that they hope that Taco Bell picks it up for use in commercials. Sadly, it’s too much fun to ruin like that. But it’s “Lullaby” that might surprise the most – the title doesn’t lie, and the song isn’t a joke. Every once in a while, the guys from Ween sober up and do something actually serious, and this is when it’s absolutely impossible to deny that these are talented musicians. “Lullaby” could nearly pass for – and I prepare to duck as I write this – Tears For Fears. Pretty and delicate, all piano, strings, and harp, it’s an actual moment of legitimate beauty from this band of known for often employing juvenile humor. It stands in stark contrast to so much else Ween does, but just adds to the reasons fans can use to refute attacks on their favorite band. Hopefully it gives someone other than the die-hards a reason to pick this one up, too. I think mine is firm. Maybe I like it extra firm. I thought you like them big and soft? I think it’s safe to trust Wikipedia in this case . . .
A 56 page hard cover book in that 2-CD/DVD box? I think it’s safe to say that’s probably not going to be cheap – but it’ll definitely be worth it from that track listing. Wow. Why do little kids like giraffes so much? And what kind of sound do they make?